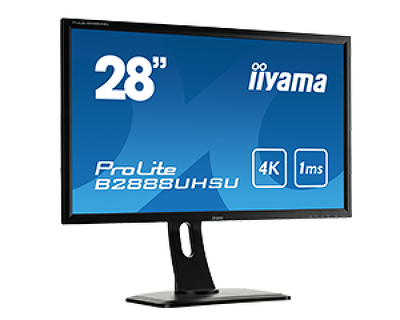 ProLite B2888UHSU is iiyama’s first 28” monitor. It features 4K resolution (3840x2160) and offers therefore a gigantic viewable area with 4 times more information and work space than a Full HD screen. Due to the high DPI (dots per inch), it displays an incredibly sharp and crisp image. Users can easily create their own work space by displaying and manipulating multiple applications from two different data sources (i.e. two different PC’s) side by side, mimicking a multi monitor set up using only one screen. The use of Flicker Free Led’s guarantees images without any flickering, even when brightness is reduced. Additionally, iiyama’s new Blue Light Reducer technology will protect your eyes from light similar to the UVA spectrum, which reduces eye fatigue. ProLite B2888UHSU features an ergonomic stand which is height adjustable. An extensive range of connectivity options include DisplayPort for true 4K content support at refresh rates of up to 60Hz, 2xHDMI, with MHL support. The latter enables content from a mobile device to be viewed on the screen. ProLite B2888UHSU also features a USB 3.0 HUB, integrated speakers and a headphone socket, to ensure compatibility across various devices and media platforms for a real multimedia experience. The ProLite B2888UHSU will be launched across Europe by iiyama in the summer of 2014 and will be available at a retail price of £499 incl. VAT (Euro 599 incl. VAT) and a 3 years ‘on-site’ Advance Exchange Warranty.